8 years old, Shalini cannot comprehend what is happening to her. "She keeps asking me, 'Naanu mele hogbidtina? (Am I going to die?) I had to tell her that it is just a pimple inside and the doctor will pop it like any other pimple." How else could a mother tell her daughter that she has cancer? "I never imagined that God would give such a cruel disease to my child." 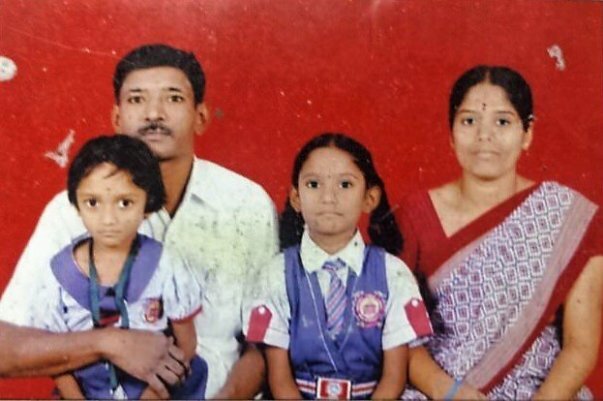 Sumitra and Ramu are Bangaloreans with a small family of two daughters, 10-year-old Varsha, and 8-year-old Shalini. Ramu works at a factory near Yeshwantpur making Rs. 7000/month that takes care of the household expenses and his children's school fees. They were barely making it until fate took a wrong turn with Shalini. "Around a month ago, she developed a fever. She was coughing a lot, so we went to a small hospital near Vidyaranyapura. The doctor said she had a lot of phlegm and they had to treat it. However, he suspected an underlying cause and suggested an X-Ray and CT scan. The reports showed a mass, and that's when we went to HCG." Neuroblastoma. 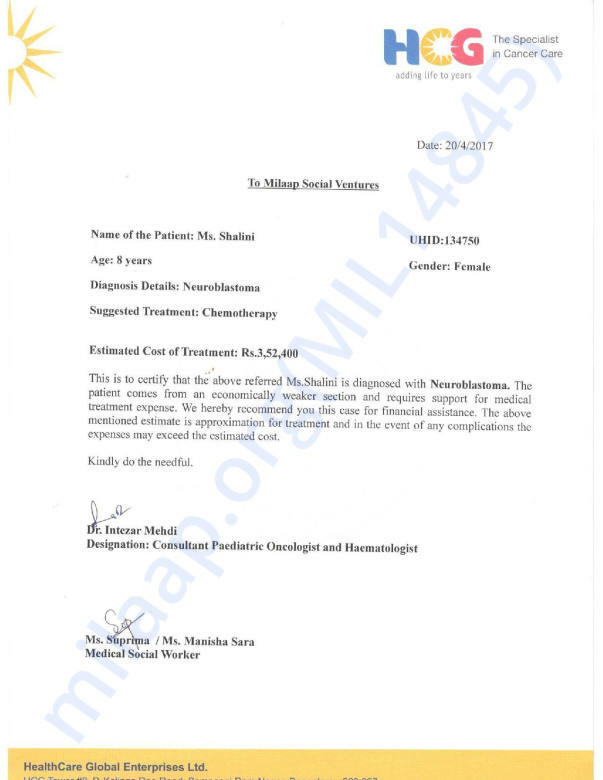 This is Shalini's diagnosis. While she was busy growing up into a happy and enthusiastic young girl, a mass of nerve cells was growing inside her. She showed symptoms when it began to metastasize and now needs chemotherapy to survive this aggressive disease. "Growing up, Shalini was always very frail and thin. I always assumed it was because her father was thin. It never struck me that she could be sick. She never really fell sick, so it tears me apart every day to think she might just slip out of my hands because of this disease that we cannot even detect until it starts aggressively attacking you." Shalini has been going through several blood test panels and finished her first round of chemotherapy. She does not know what is happening to her and cries out of fear of needles and blood. 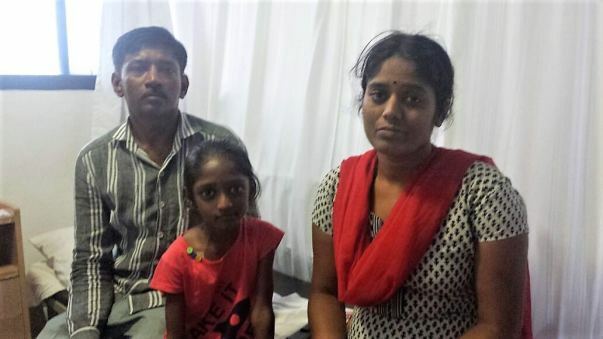 This family is unable to afford the treatment that can keep Shalini alive. They managed to pool Rs. 1.6 Lakhs from rainy day savings that were in the children's name, sold any jewelry they had, and have taken loans to afford this treatment. Shalini needs a little over Rs. 3.5 Lakhs to survive this disease. Your contribution can keep her alive. Here is an update on Shalini. Shalini had to undergo a small procedure to remove her chemo port. She is doing well and will be visiting the hospital once a month. 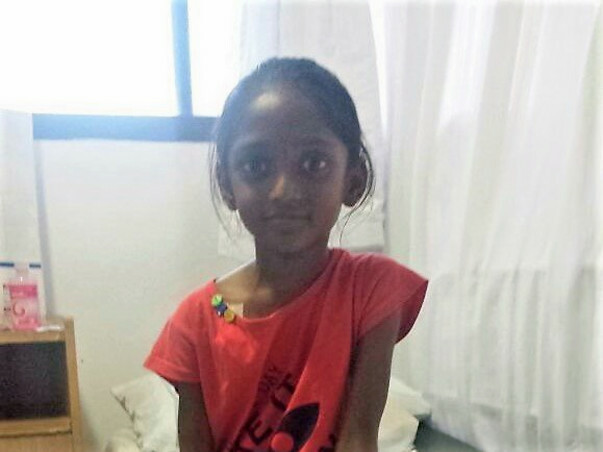 Here is an update on Shalini. Shalini is doing extremely well. All her treatment has been finished. She has visited the hospital for a regular chekup and underwent 2D Echocardiography test. She will be continuing the monthly check up at the hospital. 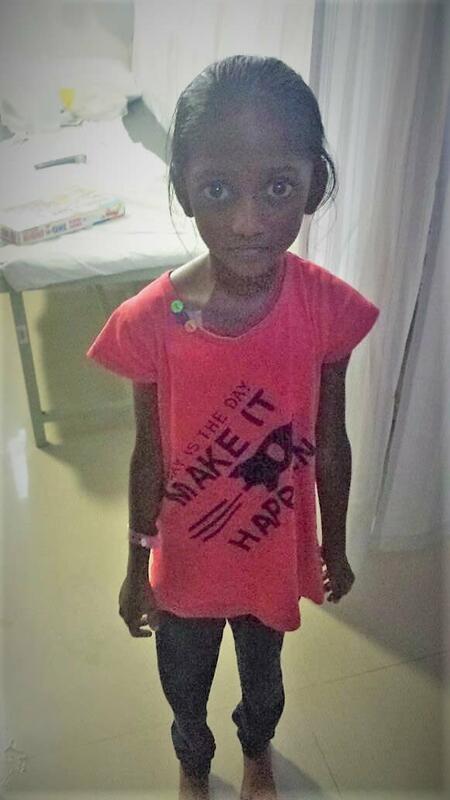 Shalini has undergone her 5th cycle of chemotherapy. As a side effect she looks weak and lost all her hair. But as per doctor, her condition is in control and they have full hope that she will get back to normal once her chemotherapy is done. Thank you so much for the support and prayers so far. We will keep you posted on the progress.